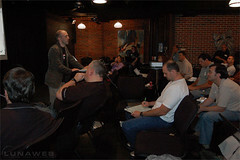 Yesterday’s post about BarCamp Fees brings me to this post about BarCamps in general and things not so obvious. Somewhere secondary to this, you’ll find scale, and awareness. But first, I promise you it’s about connecting the dispersed community of existing practitioners. 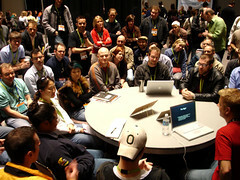 If scale and awareness become predominant, then BarCamp can quickly morph into another conference. I believe that’s what some of the people were skirting on yesterday regarding the hugely successful BarCampNashville. At BarCampNasville, scale reigned. There were a few hundred people there. Sponsors galore. Tables down the hall with tradeshow’esque presence. It had a big conference “wow” feeling. In this, it lost some of it’s intimacy of connecting the people. 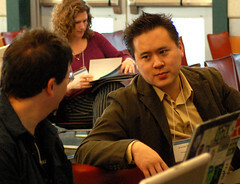 Although the Twitter conversation was started to discuss Fees, it quickly turned to the notion of two types of BarCamps. 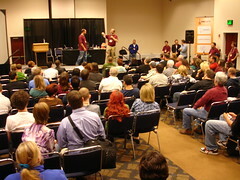 If your first BarCamp was small, intimate, and community forming. Replicating the event on a grander scale requires much more effort than increased awareness, more attendees, more sponsors (of all kinds: cash, swag, a/v, etc…) , more space, more speakers. With all this “more” there’s less intimacy and connecting of the people. With some scaling this can be facilitated by more active connectors/includers (the people connecting the people to people). However, at some point this becomes impractical and perhaps impossible. It’s been my experience* that the magic number is “around 100”, maximum. Smaller numbers are better. 10 probably being the smallest. Lots of mingling time, and maybe even some ice-breaking get-to-know-you activities. At the end of the day, attendees can state they learned X number of new things, and met X number of new people (that they can connect with again). Hundreds of attendees, lots of sessions / topics (with at least two different levels: beginner, and advanced), swag, press, awareness (local and national). Any city’s 1st BarCamp is likely going to be a Type A. If that evolves to a Type B later should be more a conscious decision be the organizers. However, it should not be the default destination. It’s the classic quality versus quantity at play again here. BarCampMemphis has a Fee. There are discount codes available. We’re not going after large or multitudes of sponsorships and the remaining costs per person works out to be $40/each to include morning snack food, lunch and beverages. Subpoint: Seasoned campers will need to know that there are beginning and advanced sessions as they are highly put-out if there is no community building AND the topics are elementary. Organized Tweetups, and the Social Media Breakfasts in Memphis (7 so far).